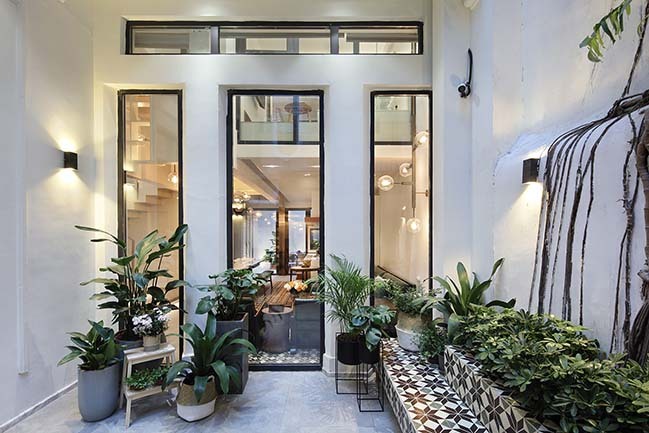 The designer Thomas Xie from INSPIRATION GROUP leaded his team for a renovation of a one-hundred-year-old house in Guangzhou. From the architect: People often say that life is like a voyage. Then, home must be that only island floating on it. It is the place where you treasure the collectibles discovered, and keep all the joys and tears you have experienced during the voyage. You may also bring back a person who is willing to spend the rest of the life with you. 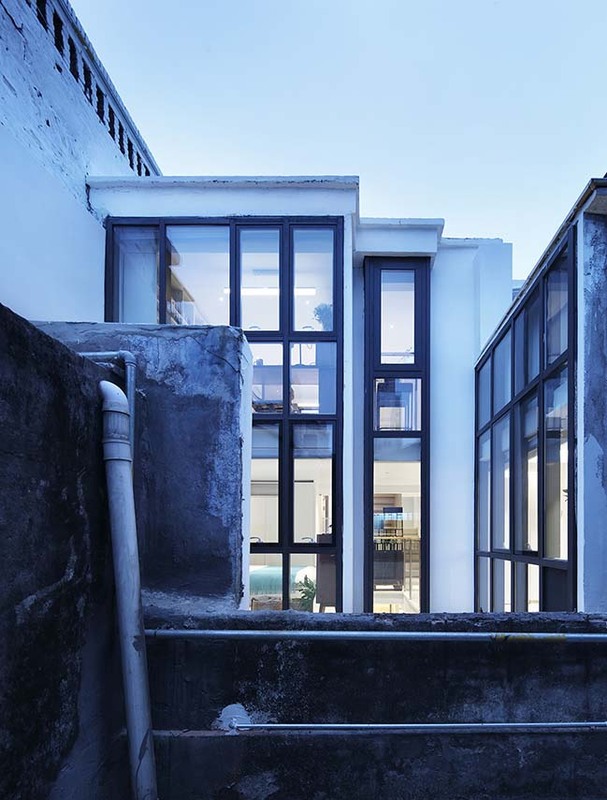 Our designer Thomas Xie was invited to lead his team for a renovation of a one-hundred-year-old house in Guangzhou, in order to achieve the finest home-living experience. In the meantime, he wanted to evoke the family’s treasurable memory, as well as to re-narrate the memory in a more lively way. There are 4 residents living in the house to be renovated, Mrs. Feng, her fourth son and his wife, as well as the youngest grandson. Every holiday, Mrs. Feng’s other children (3 to 5 people) will stay for a brief period. The house was built in 1919. Mrs. Feng has lived here since the age of nine, coming back from Malaysia for education. This old house has an abundant of memories between Mrs. Feng and her husband, as well as the growth of her five children. 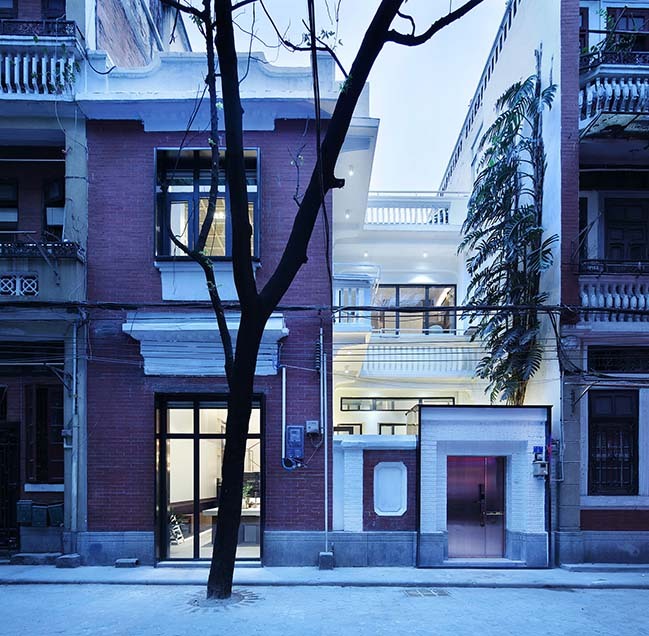 This is a three-floored house, located in Guangzhou’s old CBD, and it is a classic townhouse right next to a street, which results in a narrow shape. 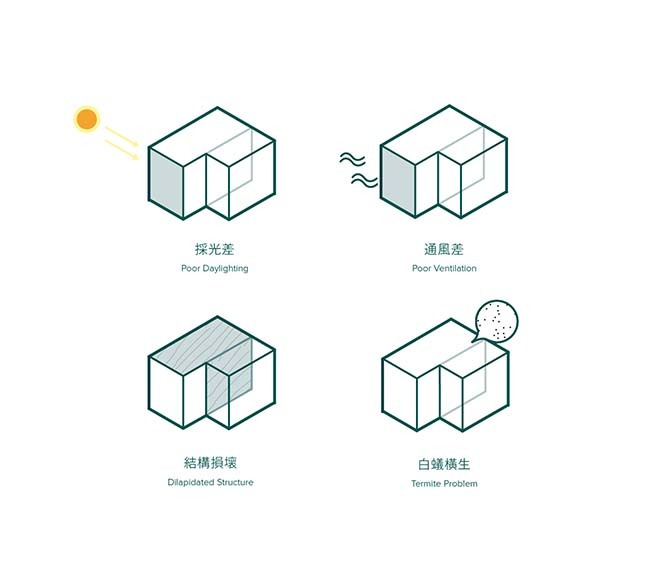 In addition, because of the inappropriate setting of the windows, neither natural wind nor light can easily enter the house, causing a serious problem of darkness and humidity. Consequently, proliferation of termites becomes an issue. Along with the structural problem due to disrepair of the house, these issues have become troubling for the daily livelihood of the family. 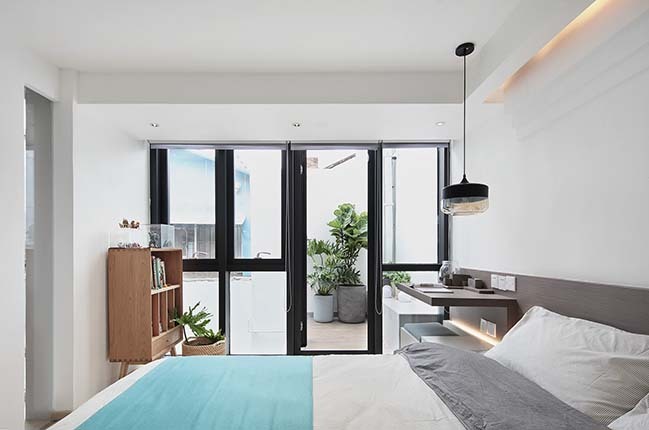 Besides the structural issue, changes in the occupants of the house has made the renovation necessary in order to meet their existing living needs. Decades ago, Mrs. Feng and her husband, as well as their 5 children lived in the house, so it was divided into many individual spaces. Nowadays, only 4 people reside here. 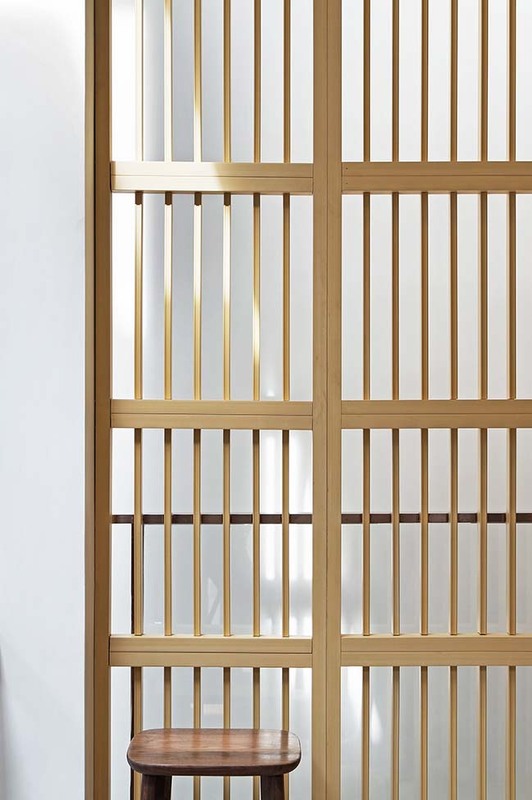 Those individual spaces are not only empty, but become boundaries of their home. 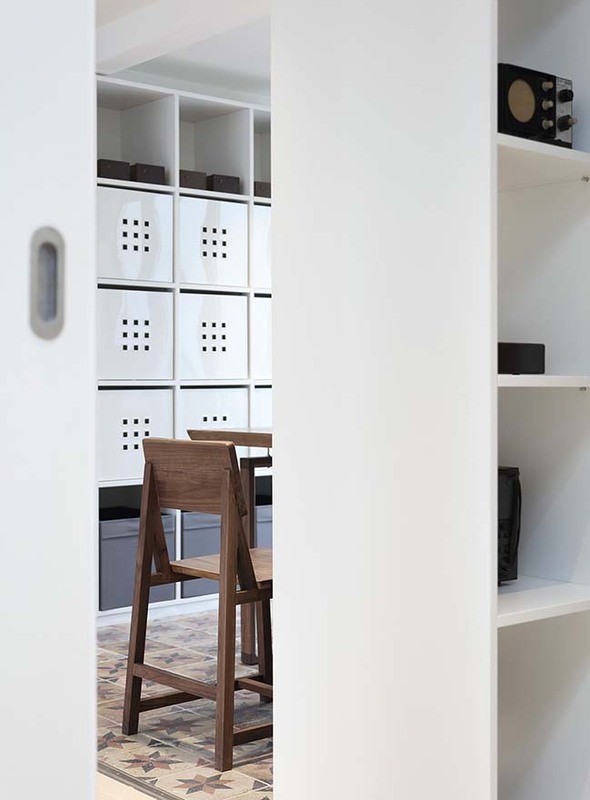 Since the functional spaces are scattered, family members are separated in different rooms everyday. 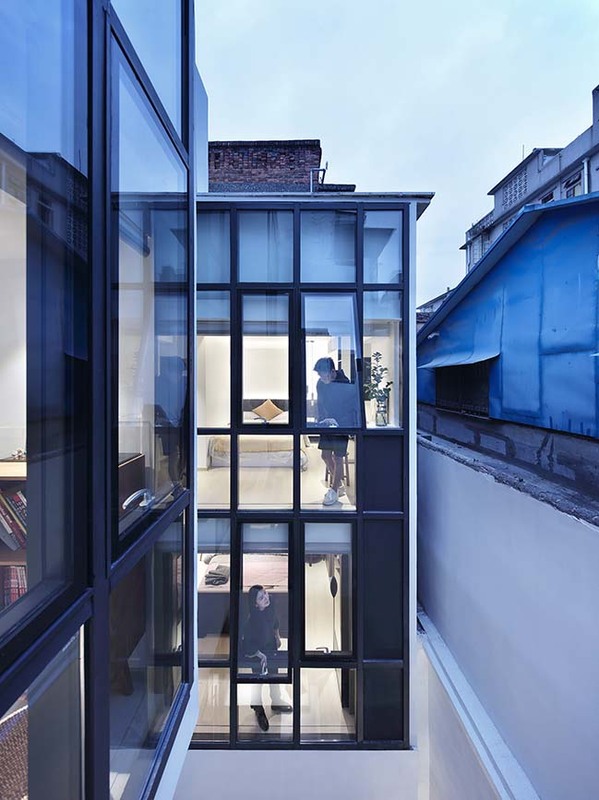 For example, Mrs. Feng enjoys having coffee in the small living room on the second floor, while her fourth son likes to stay in his workshop on the top floor and his wife surfs internet in her bedroom. Family members only interact with one another during meal time. 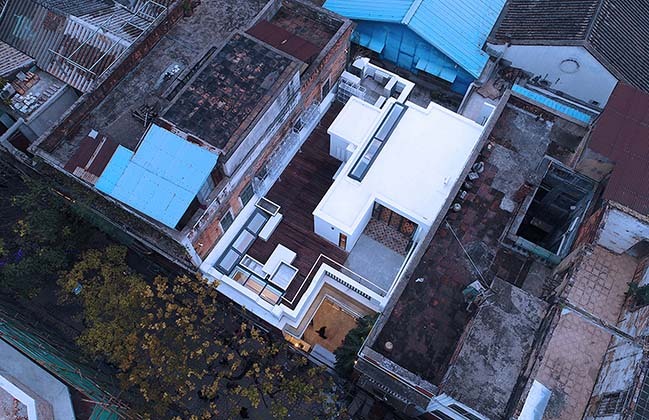 This is the third residential house project that Thomas Xie has done renovation for since 2015. 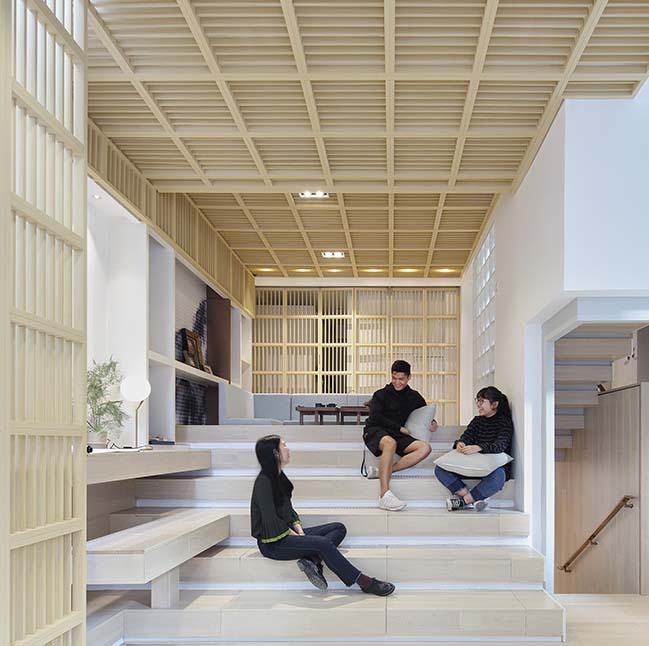 He insists on the creation of more space for family members’ interactions and togetherness through his design. His focus has always been on improving family relationships by utilizing spaces. The house originally consisted of a principal room and an ell, which are separated by a solid wall. 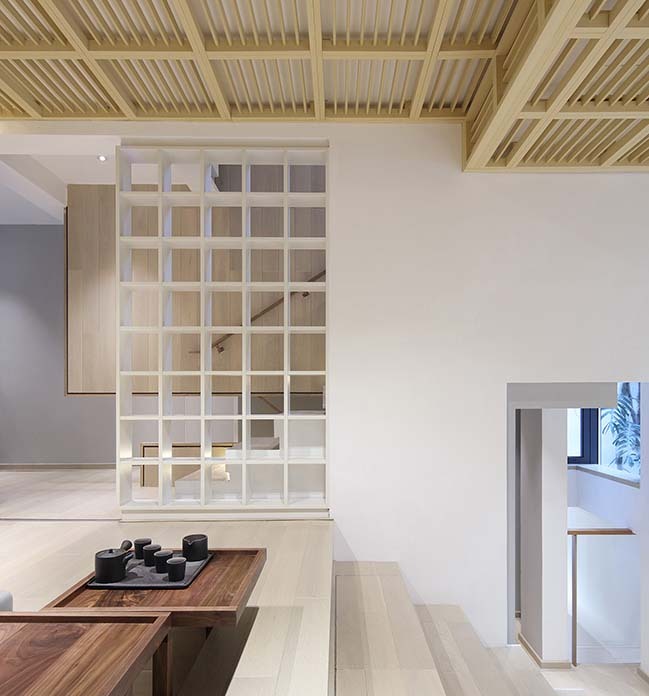 Therefore, the designer decided to connect these two sections by removing the load-bearing wall and rebuilding the steel structure, in order to change the entire floor plan. 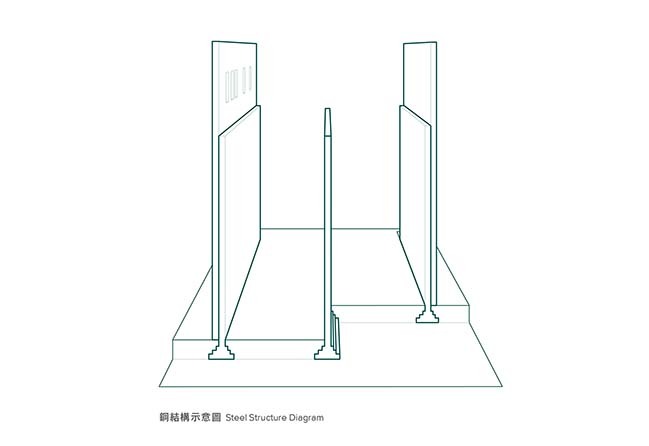 The second step is to design a Core Tube, which combines the main movement line of the family (stairs + elevator), and to re-arrange the scattered spaces. 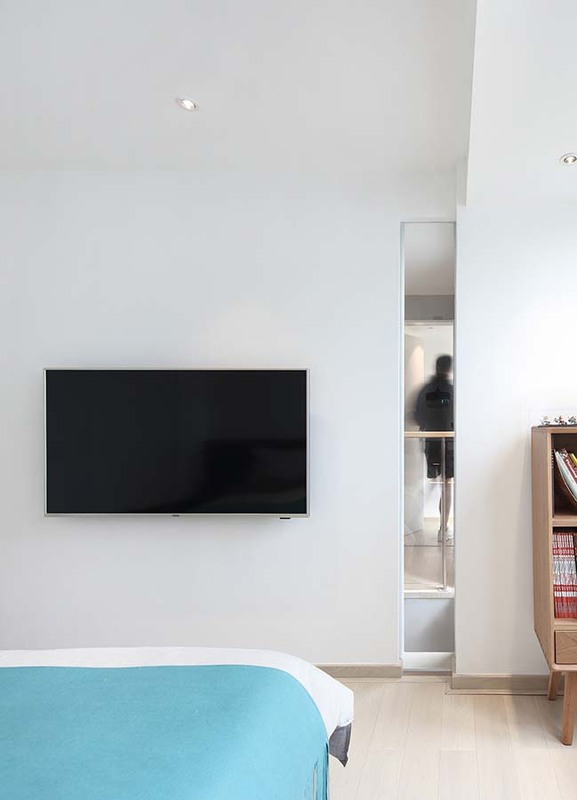 The use of Core Tube can make each room in the house interconnected. 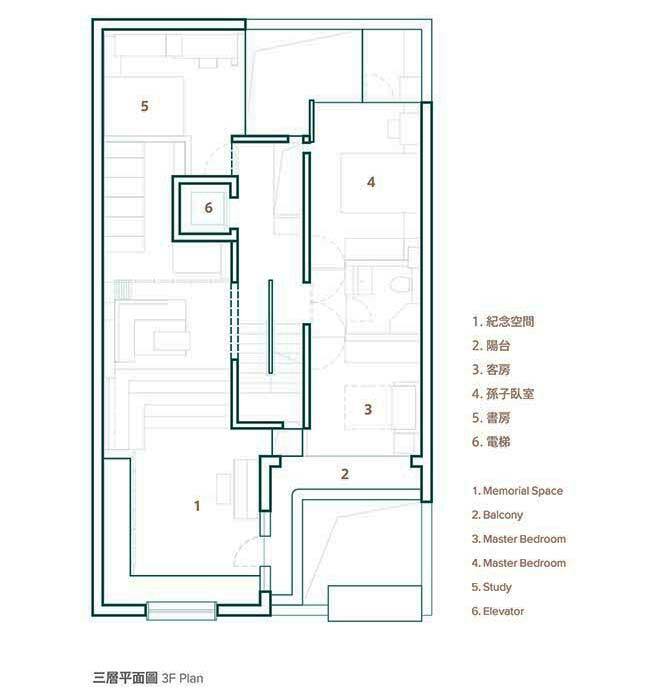 After removing all the nonfunctional boundaries and re-arranging the whole floor plan, residents will be able to walk freely and have interactions with each other in the house. Furthermore, by utilizing the front and backyard, skylight and open space, more sunlight can shine in the house. Ventilation and lighting issues are then solved. 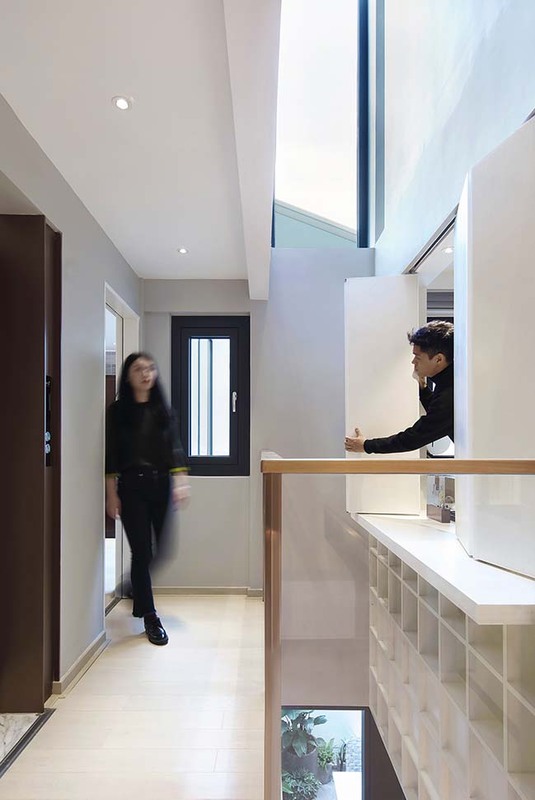 Both people and sunlight can interact in the house. 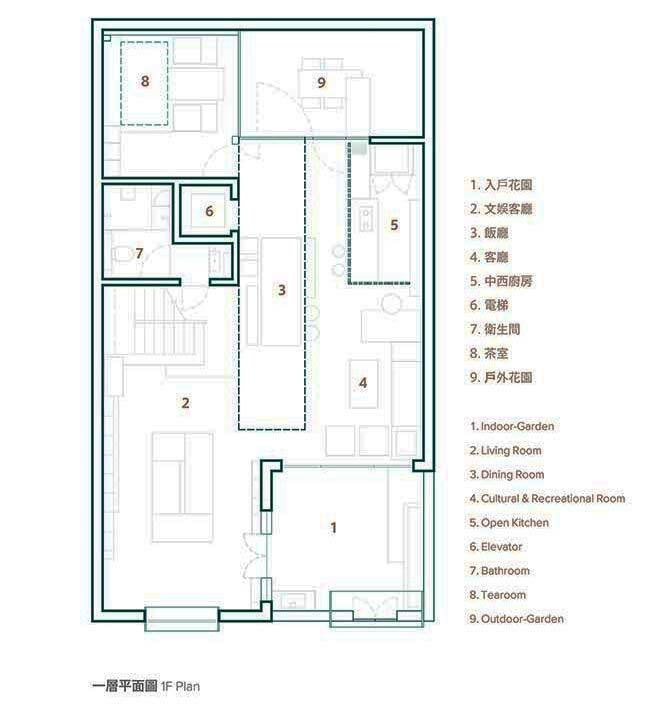 The first floor was separated by 2 rooms and had no open space. 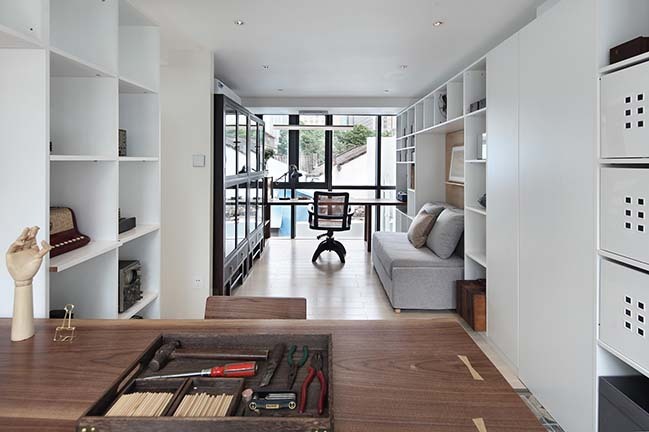 The designer changed the original structure and created a new open space. With the setting of various furniture, the first floor has now gained more functions. 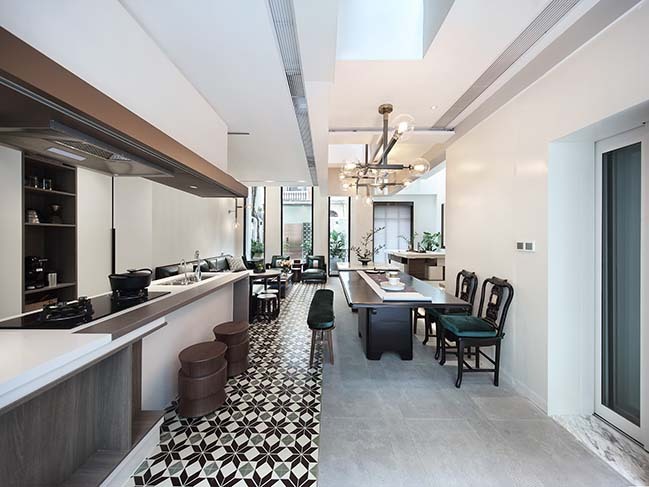 The design of kitchen has combined both Chinese and Western style. By moving the boards hung above, it can be turned into a closed Chinese kitchen, or a open Western kitchen. 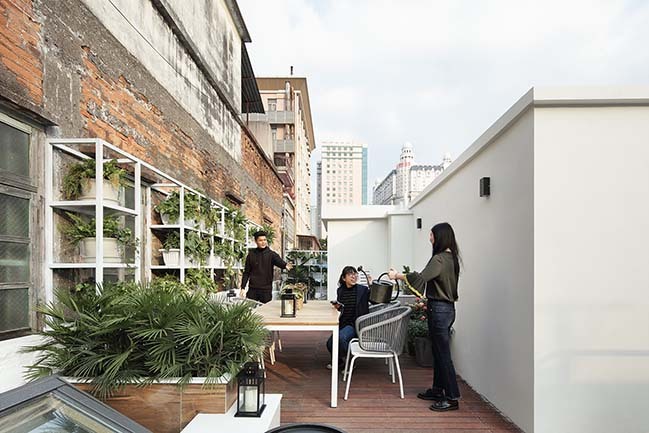 The kitchen bench can be extended to outdoor garden. When it is sunny, the family can enjoy coffee, looking at the plants without the need to walk outside. Mrs. Feng’s husband passed away, but he has always been the soul of the family. During the wartime, he decided to come back from overseas for his country. While he held high achievement in Engineering, he was also famous in Canton style of drawing. His spirit has influenced each family member for decades. 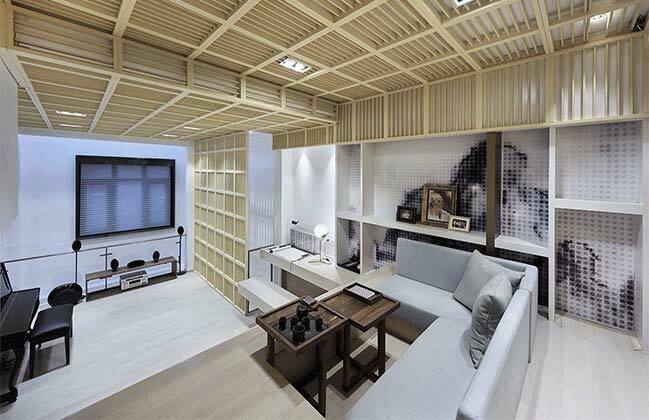 Therefore, between the second and the third floor, the designer has created a room with staggered floors specifically for leisure and cultural activities, to commemorate the father, as well as the precious memory and heritage he left for the family. 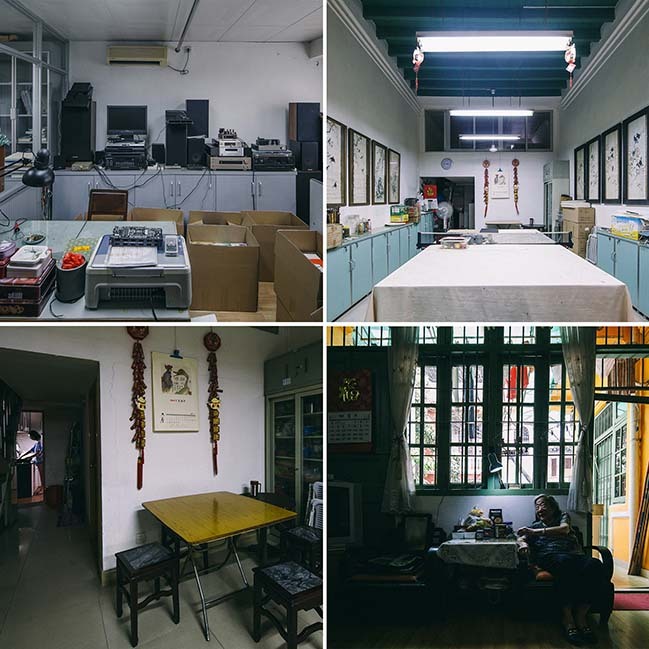 The family members can gather together in this space, to watch their old videos using a projector, to appreciate their father’s paintings and to talk about those interesting old stories. 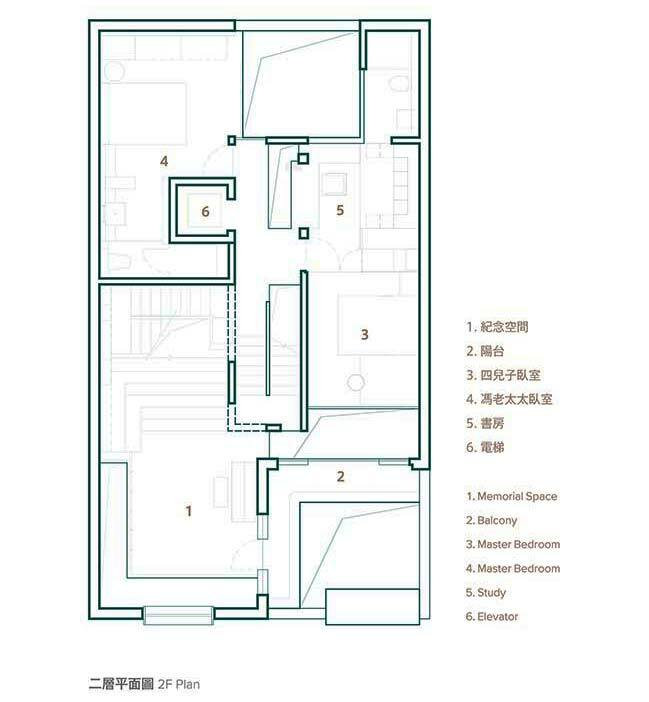 All bedrooms are on the second and third floor. 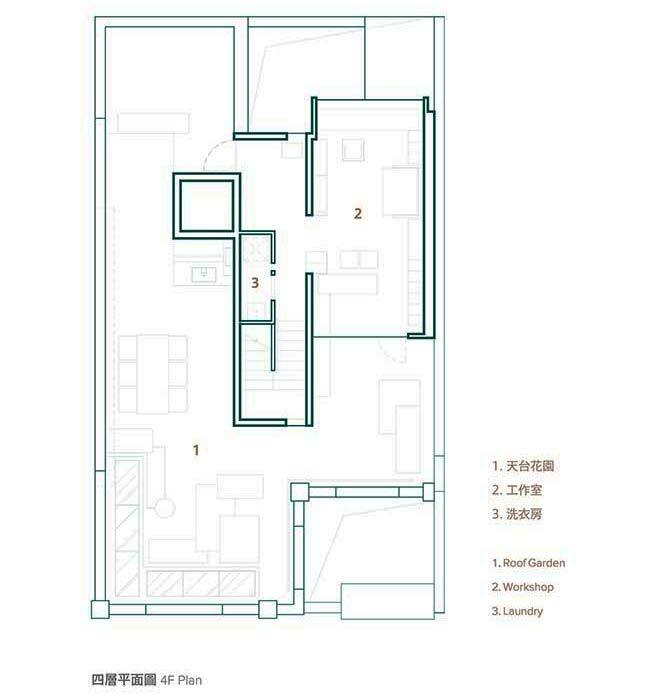 After ensuring everyone’s privacy, the designer has created a lot of sighting intersects using cavity, opposite windows and special room door settings. This intention can reduce the feeling of separation in the house. That is, even if the family members are in their own rooms, they can still see others. The son’s study is opposite. The study has different functions. The grandson’s bedroom on the third floor. Considering that Mrs. Feng’s grandson has reached the age of marriage, there will be a need for space for more family members. His own space is located on the third floor. There are a separate bathroom and a guest bedroom next to his room. Both rooms’ doors can be opened in both directions in order to combine them as one. It can be connected with the guest bedroom. 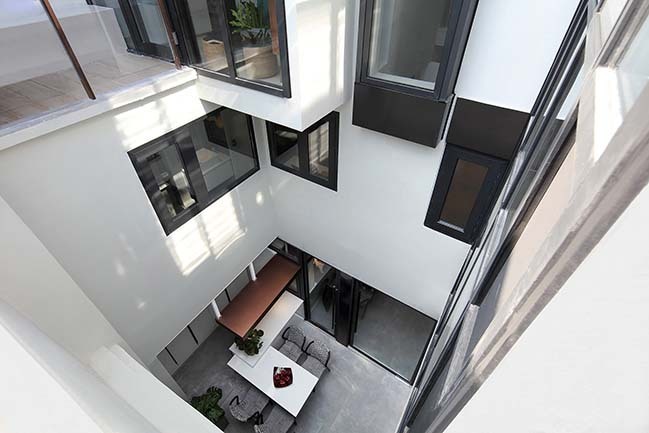 As we can see, every space in the house is linked with a large cavity or skylight. Besides the effect that more sunlight shines in the house, as long as people open their curtain, they can see other rooms in the house, which creates more interactions with other family members. 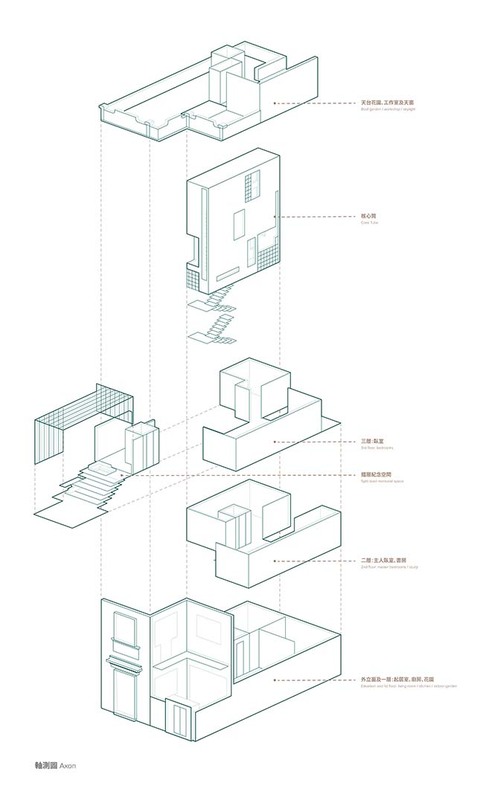 The Core Tube combining stairs and elevators is the only linkage among spaces in the house. 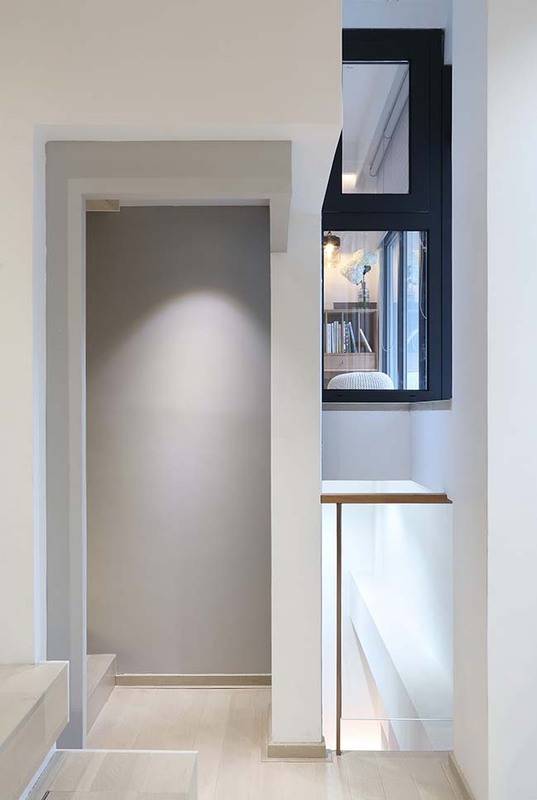 A number of small lacunas are designed in each hallway, which create a vivid scene that allows residents to find some surprises or to explore the space while they are walking indoor. 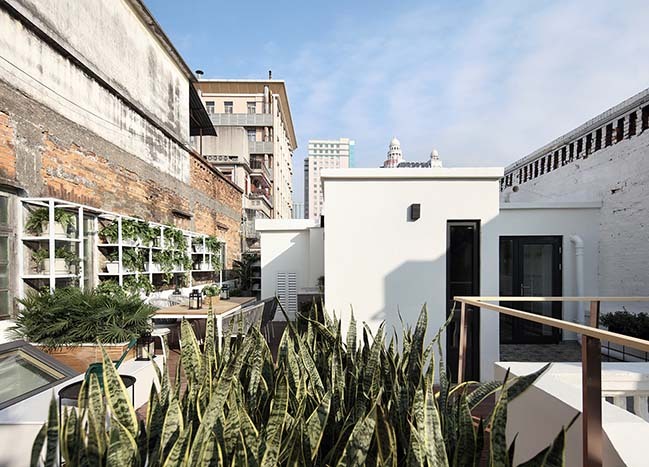 The fourth son’s workshop and a rooftop garden are located on the top floor. 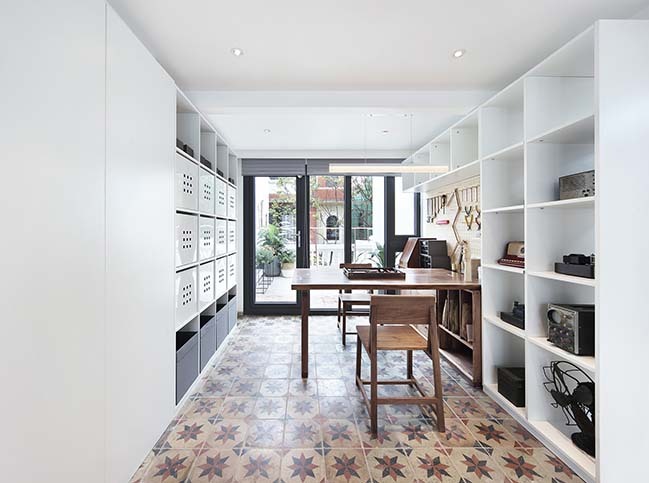 The designer has kept the original patterned tiles, old book cabinet and swivel chair from the Republic of China era. Setting them in the workshop creates an interesting contrast between old and new memory for the family. More areas for plants are designed in the rooftop garden. The old mottled walls and green pots together will provide an interesting view. In this busy city, the family has its own little green world. Not only is this house from last century, the furniture within are very precious “grandfather-generation oversees returnees”. They were acquired in the Republic of China era. Some of them are imported overseas. They are the most mentioned and treasured items by Mrs. Feng, as they have recorded so much significant memory of this family. 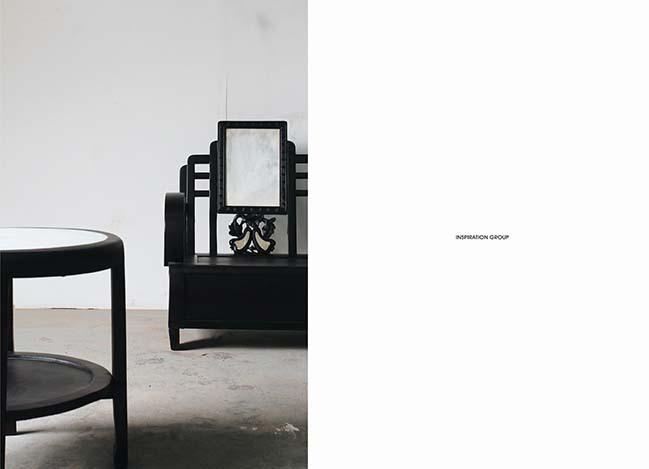 27 pieces were selected and given to experienced furniture masters for handcrafted renovation. 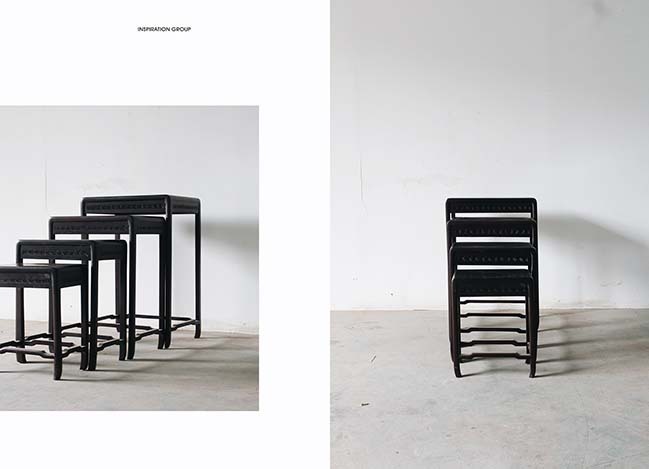 By doing this, the designer wishes that these furniture can have a fresh start and spend another century with the family. 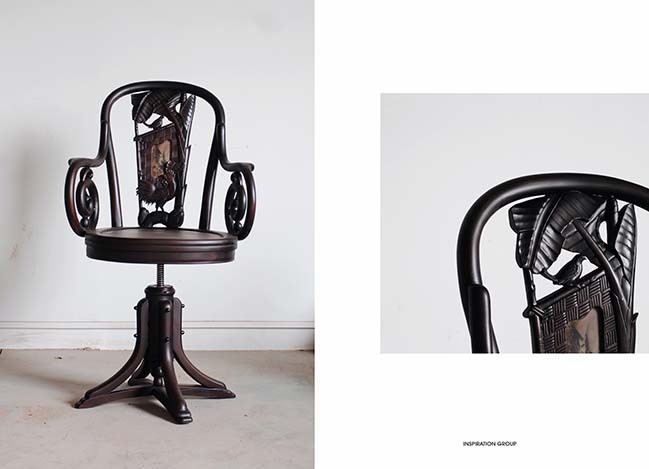 Swivel chair from old father (Mahogany). Mrs. Feng’s chair and round table (Mahogany). 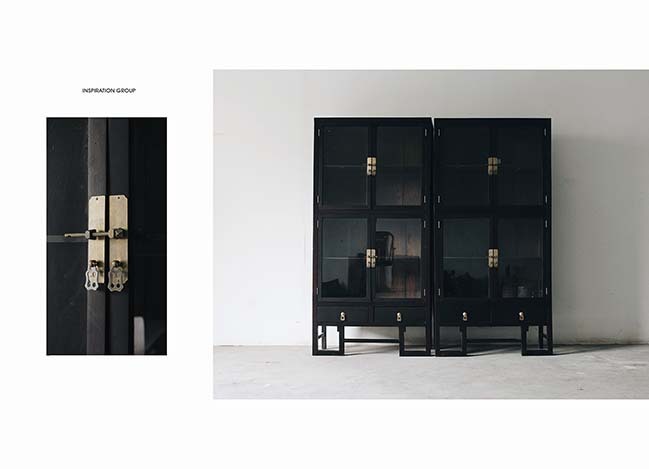 Book cabinet from old father (Borneo Ironwood).